Of all the countries we aim to look at in our Guide to IT Outsourcing Companies in CEE, Poland is by far the most spectacular one. The very history of this people is emotional to its very core - and that makes their fulminant rise to “IT Power” all the more amazing. A country ruined by the war in the most awful way there is and taken under the “protective” wing of the Soviet Union after WWII, Poland rose to economic prosperity much faster than many of the countries in the region. There are a lot of social and economic implications to this (and a lot of reasons why Poland grew faster than its neighbors). It is not our purpose to talk about politics here, though. In short, you will learn that Poland is not what you thought it was ten or twenty years ago and that it is growing to be an IT hub in its own right, moving past the “outsourcer” stereotype and digging its way out in the world as a success story. Poland is not what you thought it was ten or twenty years ago and that it is growing to be an IT hub in its own right, moving past the “outsourcer” stereotype and digging its way out in the world as a success story. How come? We have gathered the information that will change your perspective of Poland (or just reinforce your new one, if you already think Polish IT is the next big thing in the industry). You would expect that most of these companies are based in Warsaw, the capital city of the country - but that is not always the case. In fact, the power of IT seems to be pretty well-distributed among the major cities of Poland (Warsaw is, of course, one of the leaders, but it is rapidly followed in by Krakow, Wroclaw, and other cities). Most of these companies still offer outsourcing services. However, looking at their business strategies and service lines, it seems that they have all started to move towards building independent products per se as well. For instance, ELEKS’ focus goes is 30% IT Consulting and 40% of their entire work is centered on custom software development. That leaves plenty of room for growth there. Another sign that the Polish IT market is moving towards product development is the fact that niche companies are starting to pop here and there. 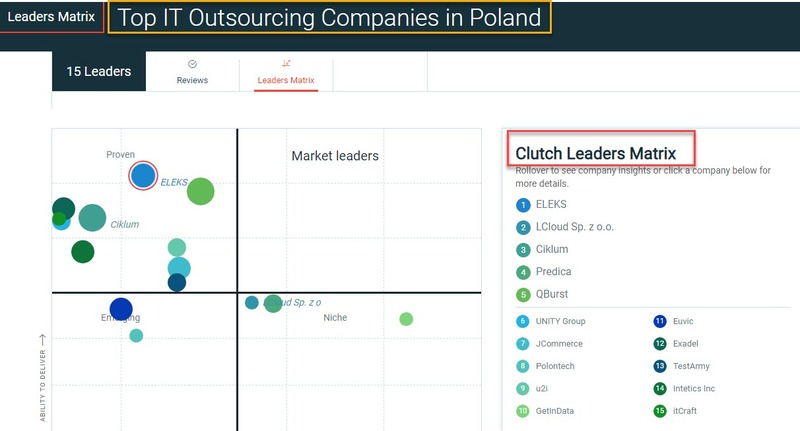 In fact, even in the first 15 Polish IT outsourcing companies, Clutch has identified no less than three niche companies (one of which focuses on testing software and ensuring its quality and security). The Polish IT landscape is pretty diverse - and with European funds coming their way, it is perfectly fair to assume that things will only move further from hereon. Most of the Polish IT companies are actually pretty involved in inbound marketing. Sure, some have higher budgets and some put less of an emphasis on this - but overall, inbound marketing is a concept that’s quite present under the Polish skies of IT. Website: Like in the cases described in the previous chapters, most of these companies have presentable websites, built to be mobile-friendly and attractive at the same time. Content Marketing: In addition to regularly updated blogs, a lot of these IT outsourcing businesses also produce long-form content (such as case studies and whitepapers), showing a clear interest in attracting leads via their digital marketing. Social Media: And, same as described before, a lot of Polish IT companies do have Social Media pages that are also up to date. Like in most of the previously described cases, Facebook is more of an employer marketing tool, while LinkedIn is both an employer marketing tool and an inbound marketing tool. Video Marketing: Maintaining the general trend in Eastern Europe, video marketing is not something a lot of companies engage in. Truly, despite being the latest and brightest trend in the content marketing area, video marketing is still an expensive tool to use when doing inbound marketing (and it’s a time-consuming one as well). It is understandable, then, why not a lot of companies engage in this. The Polish IT market is growing steadily (just like the Polish economy has seen steady growth since the 90s). It leaps about 5-10% every year, pushing the entire Polish IT industry forward from many points of view. Given that the competition on both the Polish and the global market is quite fierce (new IT outsourcing businesses popping every day), it is only fair to assume that more and more interest will be given to inbound marketing in the future. One of the reasons Poland has grown to be a leader in the IT outsourcing market is connected to the fact that they do have a lot of talent. According to A.T. Kearney, Poland scores 1.37 (out of 3) in people skills and availability. As a comparison, only Germany scores more than 2 on this section (but they score a much lower rating for the financial attractiveness side of things. That doesn’t mean IT talent can be very easily found in Poland. The more companies there are, the fiercer the competition is - both when it comes to reaching clients and when it comes to reaching quality IT professionals. As a consequence, more and more companies are offering a genuinely competitive salary and benefit packages, especially to developers who have a little experience behind them. This will not affect one of the main reasons Poland is such an attractive outsourcing target (not very soon, at least). While the total cost of hiring a programmer in New York has reached a staggering $172,000, the cost of doing the same in Poland is four times lower: $45,000. Of course, as the economy grows, salaries will continue to go up on Polish shores as well - but it is fair to assume that Poland will have grown out of its “outsourcing country” phase by then, focusing on developing their own IT products. 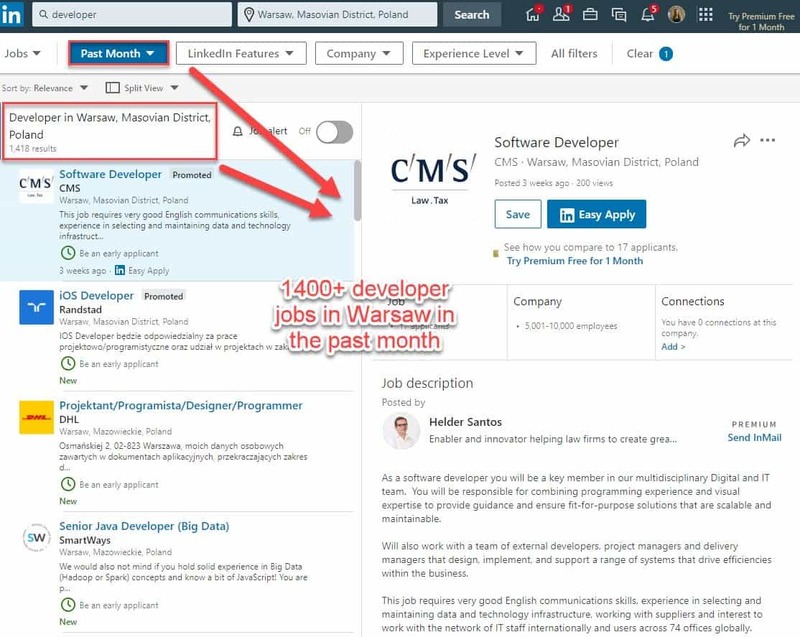 There are more than 1,400 job announcements containing “developer” in their title on LinkedIn, just for Warsaw, just for the last 30 days. This shows that there is plenty of work to do in the capital city of Poland if you’re a developer - so much so that job hopping might become an issue for employers. Poland has recently become the leading outsourcing destination for businesses in the UK, Switzerland, and the US - and that’s not that surprising, given how much effort has been put into ensuring that IT businesses in this country can actually strive. Pricing is one of the major benefits for businesses who outsource their IT needs. As shown before, it costs four times less to do the same job in Poland as you’d do it in New York, for example. Beyond pricing, it is also important to note the fact that Poland is culturally-aligned with the West and the fact that it is easy and cost-efficient to actually fly over and meet your team (especially if you are located in Europe, but not only. Even more, Polish mentality focuses a lot on self-improvement - something that feels common to the mentality of most of the Eastern European countries. Where Americans might feel self-sufficient, Polish people dislike everything and continuously strive to improve their work, themselves, their services, and whom they are perceived as. All of this is topped by a government that supports FinTech entrepreneurship to the max. As they are slowly working towards making their IT businesses more secure and generally easier to run in Poland, it is expected that more and more businesses will start to develop in this direction. The excellent quality of Polish IT services contributes massively to the opportunities this sector is creating for their country. According to HackerRank, Poland scores high on multiple verticals in IT programming. 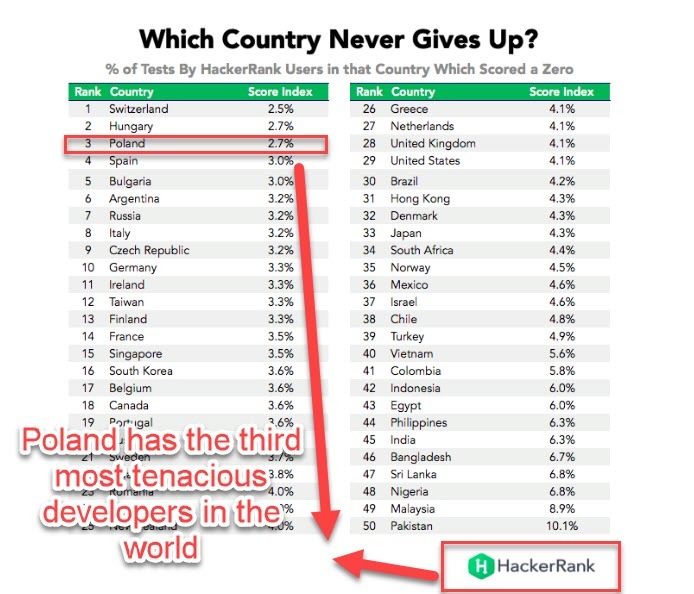 Overall, Poland scores 98 on all the HackerRank challenges (just two points away from the winner, China, and 41 points higher than Pakistan, a country that used to be generally considered to be a good resource for IT professionals). Poland seems to be nearshore and even offshore haven for businesses who need to outsource their IT. Poland itself is a success story from an economic point of view (they showed the highest GDP per capita growth in OECD and Europe between 1990 and 2015). Beyond the surface, though, the major challenges Polish IT might have to face in the future are deeply political. With conservatives taking over the reins, it is likely that Polish economy might take a turn for the past. It would be, of course, a bad financial move - but only time will tell how thorough the conservatives will be in terms of reducing tax incentives for IT specialists and businesses (or if they will do such a thing). Being an export-driven economy, Poland’s success is much dependent on the major partners it has (Germany being one of them). If a new economic crisis were to strike, it would undoubtedly affect Germany and, consequently, it would affect Poland as well. And if Poland’s economy is affected, their entire IT sector might be affected as well. In the same line of thought, it is worth mentioning that Brexit might affect Poland as well. As a lot of IT outsourcing companies in Poland are nearshore providers for UK businesses, Brexit might actually take a toll not only on British businesses but on Polish IT businesses as well. Last, but not least, one important factor to consider is the one we have mentioned in the beginning of this guide: Germany’s openness to receiving Ukrainians workers without a visa. This might attract a migration of Ukrainian IT workforce from both Ukraine and Poland towards German companies - but, again, only time can tell what an impact this will have (or if IT specialists will be interesting in making the leap towards the West). These are, of course, hypotheses - and not by any means are they intended to be an actual economic review of Poland. It is, however, important, to be at least vaguely familiar with the major concerns in Poland’s IT sector - just enough to understand that yes, there are risks as well. 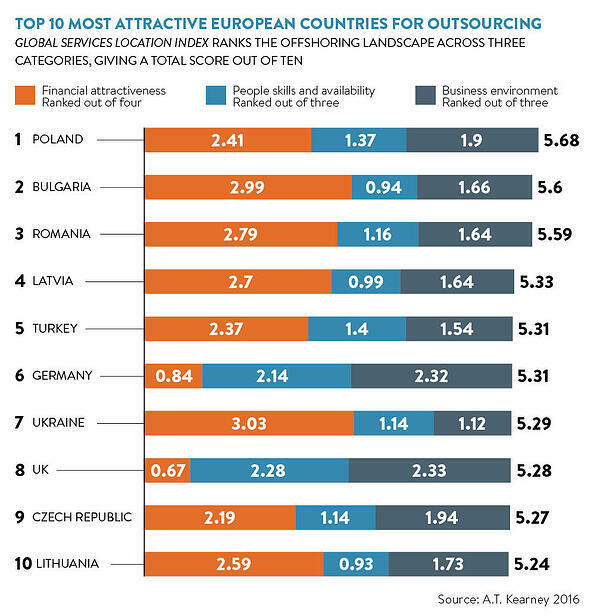 These risks are, however, much less poignant than in most of the other major outsourcing destinations around the world - and Poland remains one of the best places to outsource your IT too. As you will see later on as well, Romania and Ukraine are strong contenders to the role - but they still have a long road ahead of them.